The same family from Lindbäck (Sweden) has been at the helm of Lindbäck Bouw – manufacturer of Swedish housing systems – for four generations. It was founded in 1924 by Frans Lindbäck. Since then, the company has grown steadily and is currently owned by brothers Erik and Gösta Lindbäck and their sons, Stefan and Hans. Turnover has grown by about 15% over the past four to five years. In 2006, turnover reached approximately 270 million Swedish krona and staff numbered some 100 employees. In more recent years, the company has been producing higher volumes of larger housing systems. Efficiency plays a major role in its operations. This is why internal logistics were overhauled to improve throughput, which in turn resulted in better products and increased standardization. Lindbäck manufactures an average of eight units per day, equivalent to 200 m² of building system. 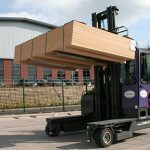 Often, several trucks or freight trains have to be loaded with elements depending on the size of the accommodation or company premises being built (sometimes up to five storeys high). These elements are packed in special-purpose crates to prevent damage and moisture ingress. Crates weigh approximately 7000 kg each and are very wide meaning that special-purpose transportation is required. Onsite assembly is extremely quick because both room and roof sections are delivered prefabricated. The roof is transported to the worksite where assembly is completed by lifting the roof into place on top of the main sections. 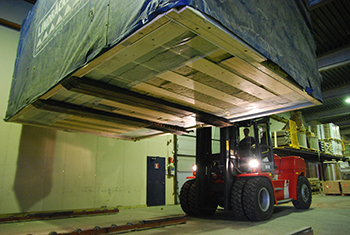 To handle these extreme loads, management recently acquired a new Kalmar truck mounted with KOOI-ReachForks®. This new DCE180-6 Kalmar truck has a lifting capacity of 10750 kg at 1200 mm and a lifting height of 5000 mm. Hydraulic forks were supplied by Rodab AB, MSE-Forks’ Swedish importer. These special telescopic forks have a lifting capacity of 26000 kg with a load centre of 600 mm, retracted length of 2800 mm and a 1400 mm stroke. Lindbäck Bouw opted for these telescopic forks because regular forks were too long requiring an enormous turning circle, which compromised workplace safety. 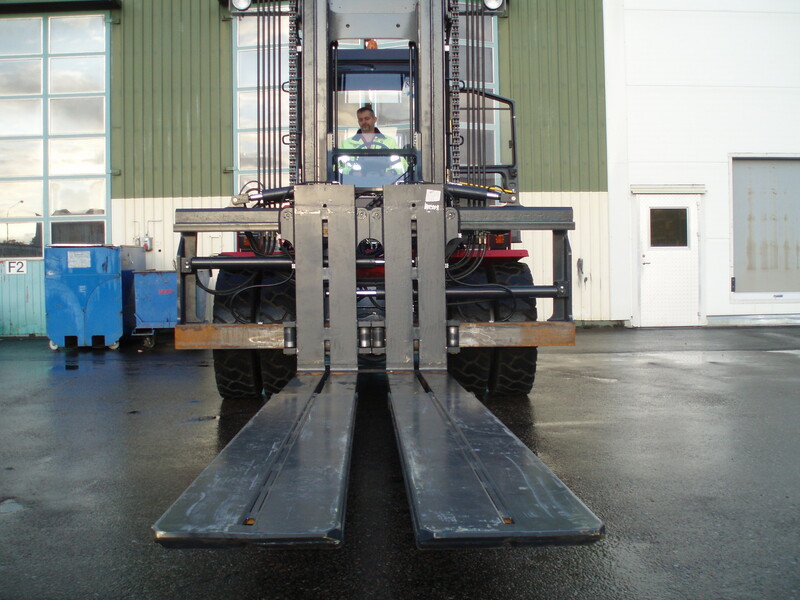 ReachForks® are fitted with a special mounting frame because they are attached to a Kalmar fork positioner. This unit allows the telescopic forks to be extended and retracted within the forklift truck’s cab for better stability. Use of telescopic forks not only improves safety on the work floor, but also allows for more efficient utilization of the space available.